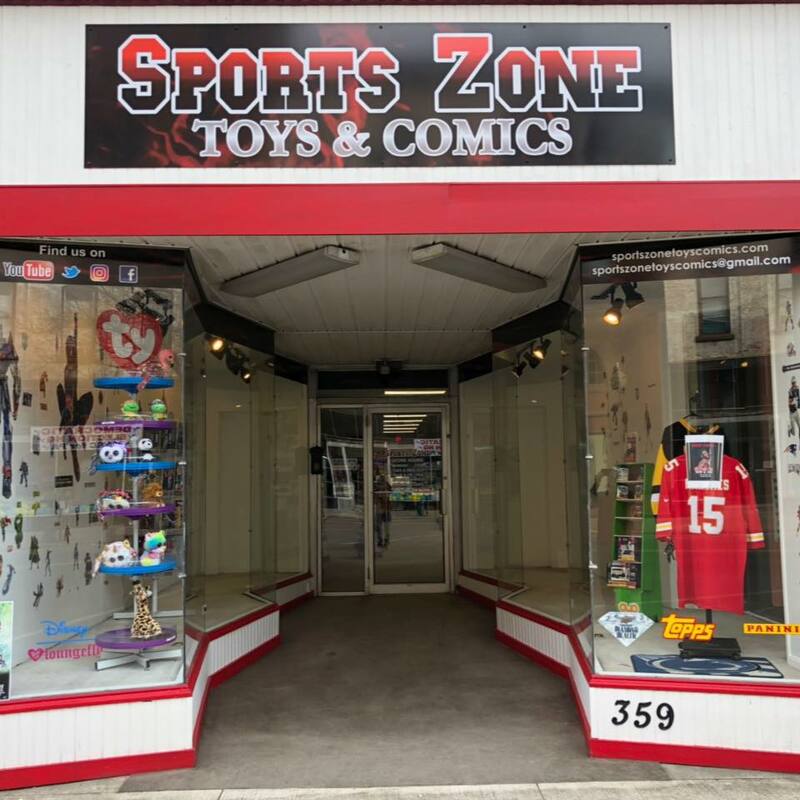 Sports Zone Toys & Comics is a card shop that’s been around for over ten years. 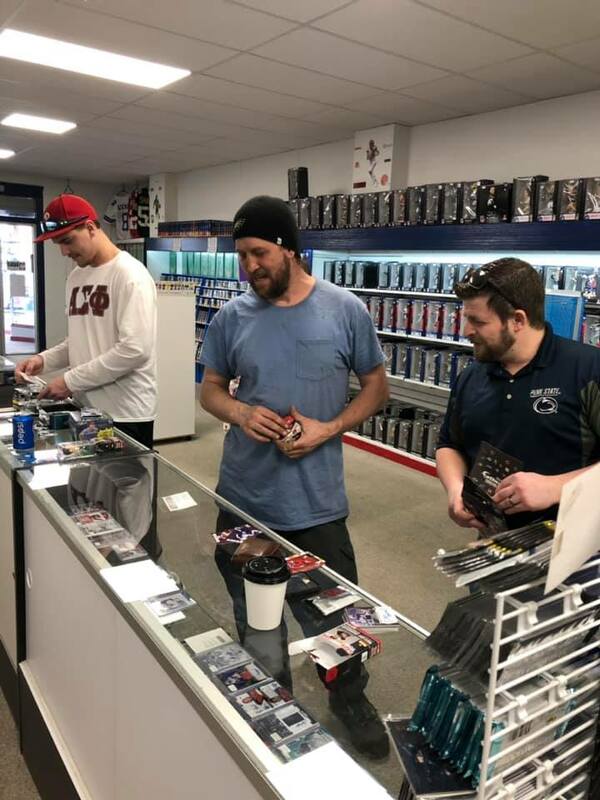 The shop recently moved into a new location – 359 Market St., Sunbury, PA. I attended it’s grand opening this weekend. Let me tell you something. This is how every single brick-and-mortar store should look. Its easy to get into, lots of space to move around, and very well organized. Every collector should have this type of shop in their backyard. Glass cases full of singles, sealed boxes, packs, OYO minifigures, bobbleheads, and new/used wrestling figures just cover some of the items you’ll find. There are even some tables you can sit down at and rip open a box. I highly suggest stopping in if you’re around the area. To commemorate the grand opening, special OYO minifigures were made with the Sports Zone Toys & Comics name on them. Along with the minifigure came a coupon. 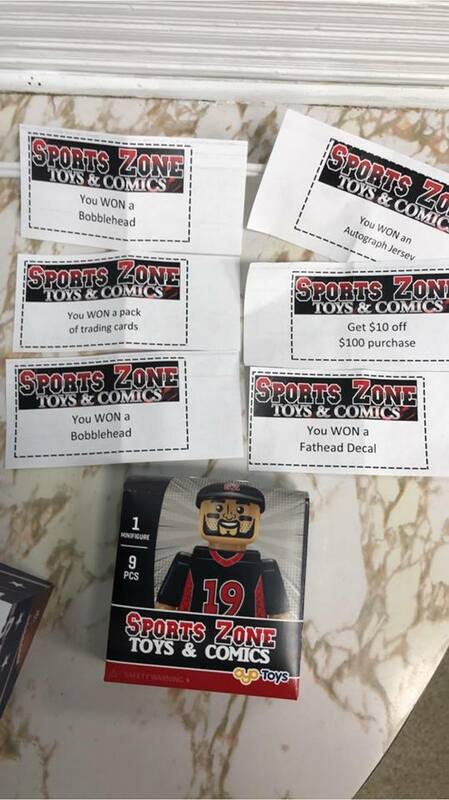 These coupons ranged from $10 off of a $100 purchase, free bobblehead, free Fathead, etc… Very cool! 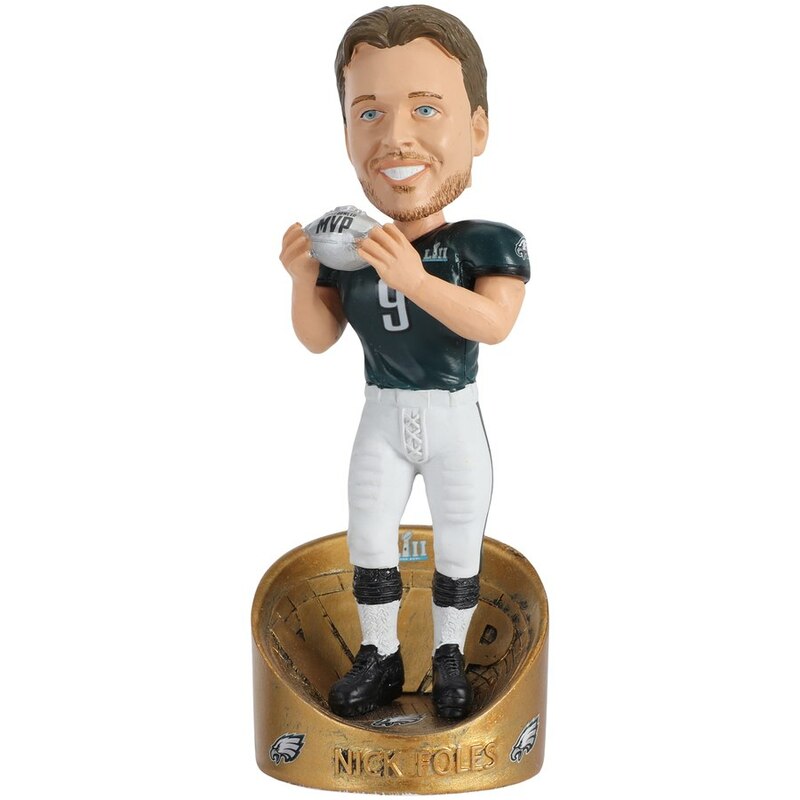 I left with a new Nick Foles Super Bowl LII MVP bobblehead, and a Phillies TeenyMates Big Sip water bottle. 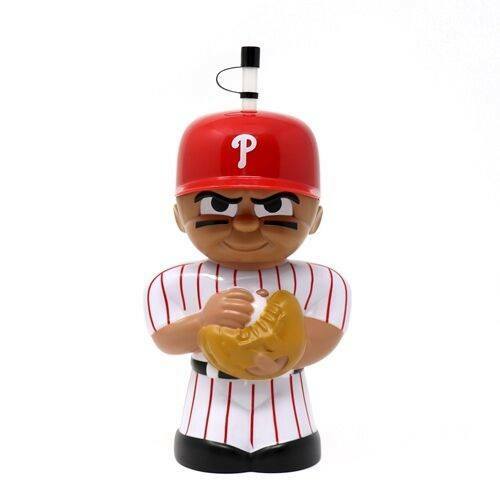 Next month I’ll be heading back as that’s when the Gritty bobbleheads are due out. There are about 300+ pins hanging on my wall. All pinned to lanyards. A large chunk of the collection are pins from the Little League World Series. They all vary in rarity. One of the harder to find pins that I acquired this year was this 11th Annual 2015 Grand Slam Parade Committee pin. I’ve never seen this specific pin for sale before. The Grand Slam Parade has kicked off the Little League World Series for the last 11 years. Its a big celebration that features every team participating in the World Series. Plus there are marching bands, antique cars, fire trucks, military equipment, the list just goes on and on. They usually get a baseball player to be the Grand Marshall. Over the years they’ve gotten many retired/HOFers to take on that role. For 2015 they had Jim Leyland. Its not uncommon for people in the parade to be giving out pins. 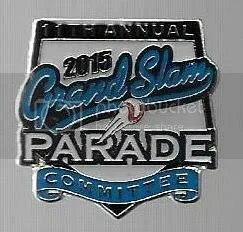 Throughout the city of Williamsport there are different places you can buy the annual Grand Slam Parade pin. For the past seven years these pins have been split into two pieces like a puzzle. I don’t think the committee pins are made available to the public. You probably need to be on the committee to get one. This pin slipped through the cracks. 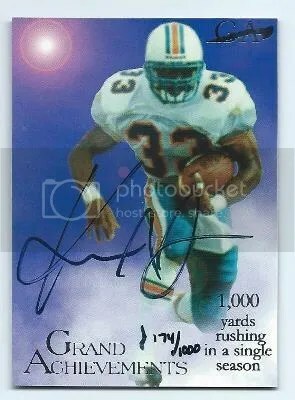 Congrats to dawgpaws on being the lucky winner of the Karim Abdul-Jabbar 1997 Genuine Article Grand Achievements Auto #’ed/1000. Once dawgpaws sends me their mailing address, I will ship this card for free. Thanks!!! When Tiger Woods won the 1997 Masters Tournament, collectors were eager to get their hands on his cards. At the time, they had to settle for only a few. The first being his S.I. for Kids card that came packaged inside the popular kids magazine the year before. The second being his 1997 Grand Slam Ventures Champions of Golf Masters Collection Gold Foil and Gold Ink versions. 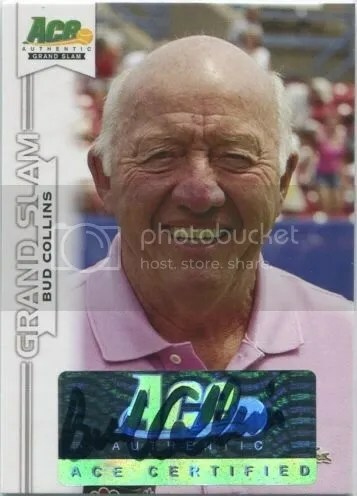 The 1997 Grand Slam Ventures Champions of Golf Masters Collection is a 62-card set. It has in it one card for every Masters Champion from 1934 to 1997. Luckily, Tiger Woods just made the cut. The most common version you’ll find are the Gold Ink cards. They issued thousands of these within sealed sets. The Gold Foil version is much rarer and was only made available to collectors that subscribed to the series. Both version are very condition sensitive due to the black borders. Obviously, the Tiger Woods cards are worth the most. Sealed boxes can be found for $100.00.